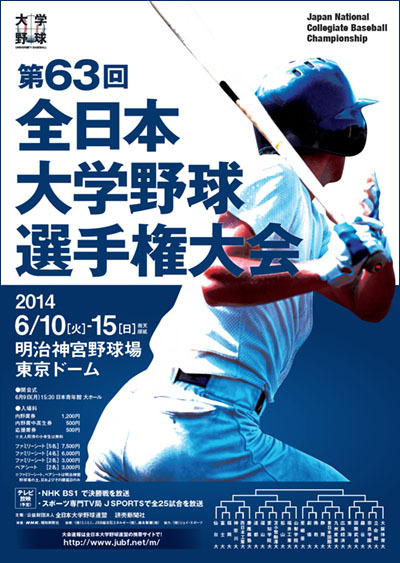 26 Regional Champions of University Baseball Teams started the 63rd National Championship in elimination tournament at Tokyo Dome and Meiji Jingu Stadium for 6 days from June 10, 2014. Day 1 at Meiji Jingu Stadium:　Fuji Univ. 0-1 Fukuoka Univ., Kanagawa Univ. 7-0 Nishinippon Institute of Technology, Dohto Univ. 8-1 Fukuyama Univ., Aichi Gakuin Univ. 5-0 Tomakomai Komazawa Univ. Matsuyama Univ. 0-6 Fukui Univ. of Technology, Soka Univ. 4-0 Bukkyo Univ., Shizuoka Univ. 1-2 Higashi Nippon International Univ., Kyushu Sangyo Univ. 1-0 Hiroshima Univ. of Economics.